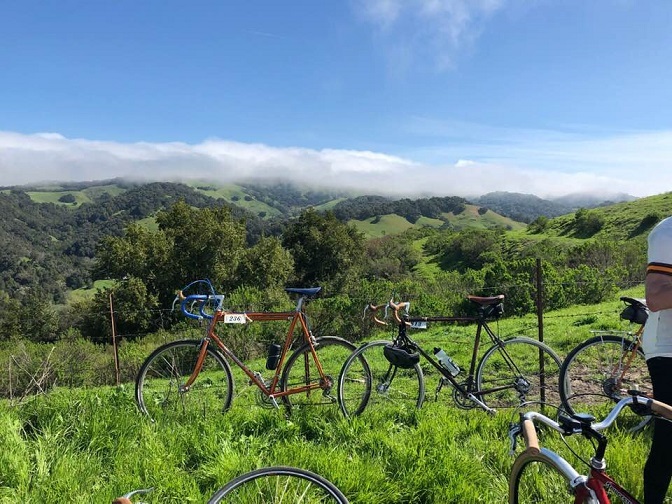 Last fall, we went to Italy and spent a week in Tuscany with the touring company Ciclismo Classico. 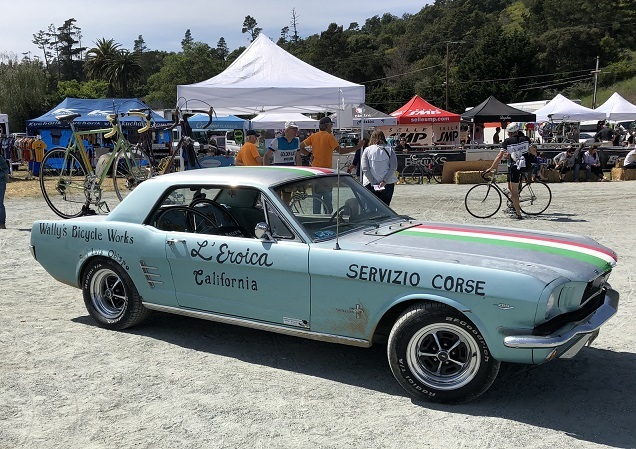 The pinnacle of the tour was “L’Eroica,” a two-wheeled nostalgiafest featuring pre-1985 bikes or replicas, wool jerseys, miles of gravel road, a relaxed pace (wine at the check-in/rest stops… really! ), and lots of ’70s hairstyles and mustaches. 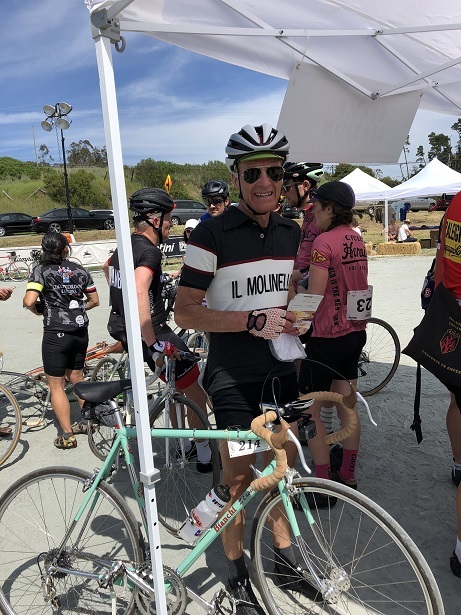 He not only tackled and survived the 80-mile gravel ride, but turned around and registered for the same event in California, to be held this month. I got it made in the shade. 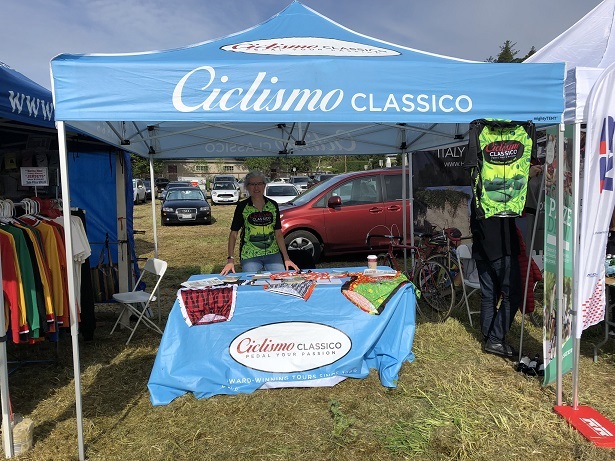 Ciclismo Classico owner Lauren wanted to have a booth at the California event, but couldn’t squeeze the weekend into her packed schedule. “Well, we’re going, and I’m not doing the ride….” So I volunteered to man the booth and hand out brochures and generally tell people how wonderful and fun our Italy tour had been. They sent the materials out and, just like that, I had something to do while waiting for Brent to grind over all that gravel. And now I’ll let Brent share the photos he took on the tour. 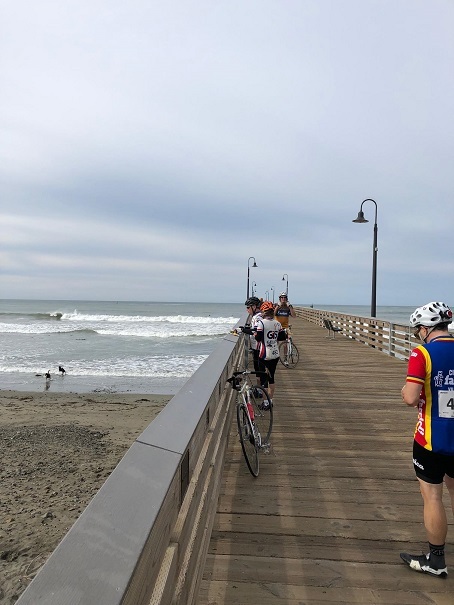 First, a run down the coast to the first check-in. Some of the roads were really nice! 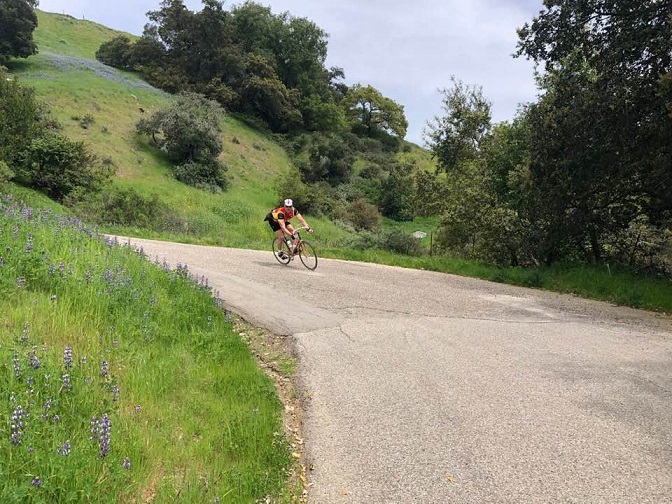 Then the death-defying downhill on rough road, complete with hairpin turns. Brent was walking. The guy on two wheels must be a local. Here he is at the finish, tired but triumphant. 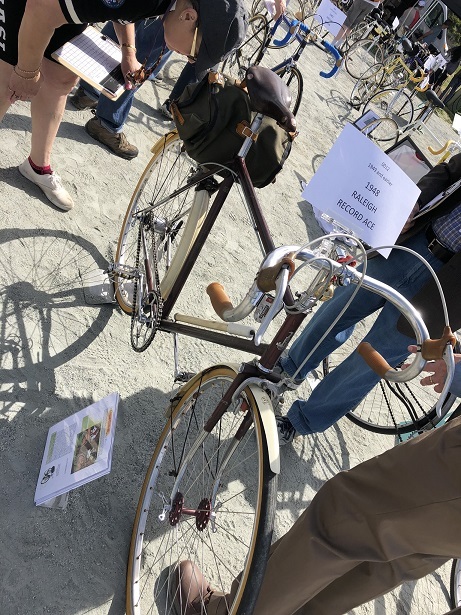 Meanwhile, there was a contest between some of the antique bikes. Here’s a 1948 Raleigh being judged. Well, that’s just a taste of our weekend. I hope you enjoyed it! 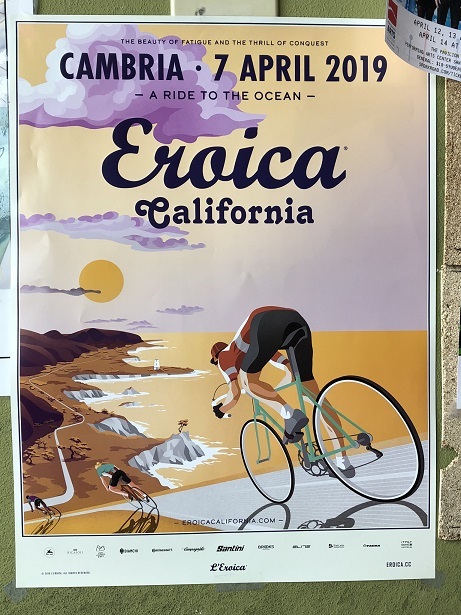 Y’all… we just got back from “Eroica California,” a historic cycling event in Cambria, California. And did we EVER pick the best place to stay! We’ve participated in big cycling rallies before, and Problem One is always parking. A little research turned up a B&B with its own off-street parking, maybe 400 yards from the rally’s start point and expo. Going the other direction, the main business district is about the same distance. We would pretty much never have to move the car. 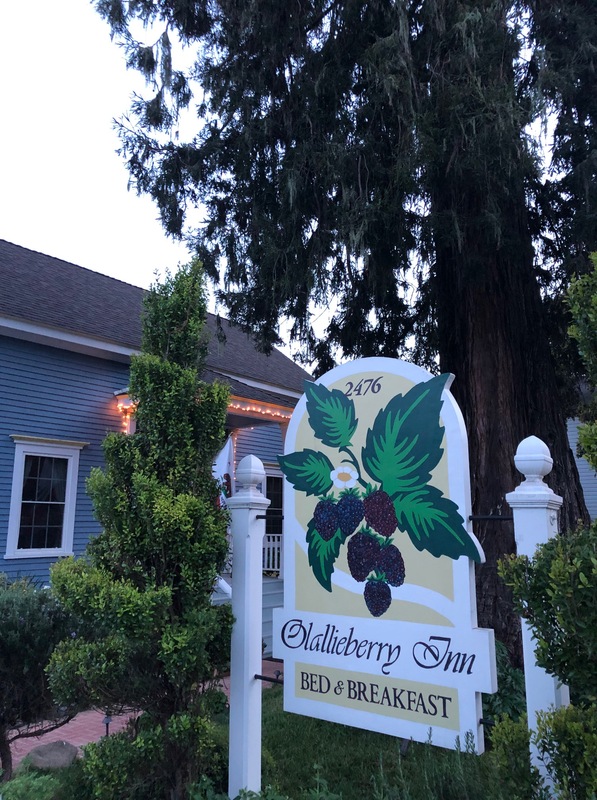 Not gonna lie, that’s the biggest reason we chose Olallieberry Inn. Yeah, but then we actually arrived. We found the house was built in 1865 and the front yard features a sequoia tree that’s probably a zillion years old (give or take). A friendly staff member welcomed us and showed us to our room, which had its own window seat and gas fireplace. Travel stress started melting away on the spot. After a comfortable night’s sleep, we enjoyed a lovely breakfast–a different one each of the four mornings we were there. The food was delicious, made with expert care by the cheerful staff. Coffee, hot water for tea and cocoa, and fresh cookies seem to be on duty at all times. Then there’s the Happy Hour every afternoon. 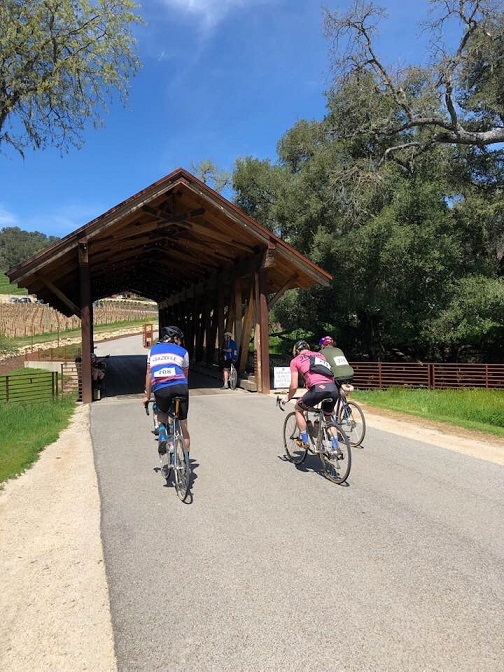 We sat out on the deck nibbling appetizers and sipping wine, and got acquainted with other cyclists who were in town for the event. Need a local’s recommendation for a dinner place afterward? You got it. 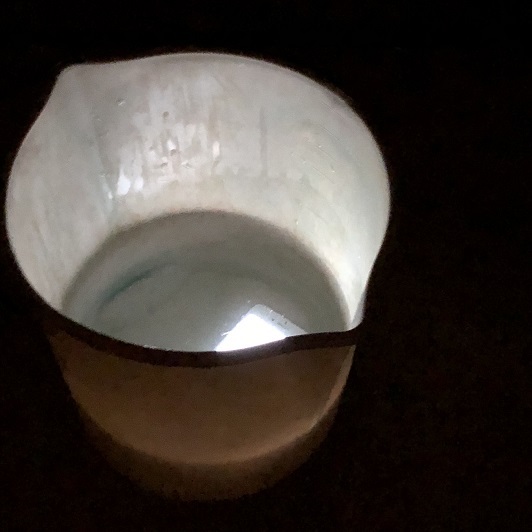 In the evening, we’d stroll in through the back, pausing to enjoy an impromptu chorus of tree frogs down by the creek and watch the birds stuffing themselves at two birdbaths generously filled with seeds. Hm, those birds may have reminded me of myself at breakfast. But never mind that… I think I’ve found my new happy place! Next time I’ll tell you about the cycling event itself. Meanwhile, for more photos and information, click here to check out the Olallieberry Inn website. If you liked Flash: the Donkey, you will adore Walking with Henry. 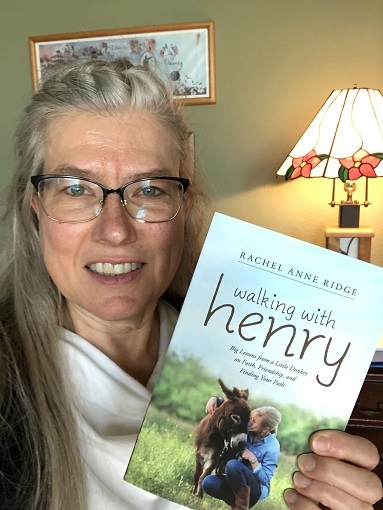 In this lovely book, Rachel Anne Ridge candidly tells her own story of the tragedy, struggles and questions she’s dealt with. Rachel and Tom thought Flash needed a companion donkey, so they (sort of) jumped on the opportunity to adopt a rescued miniature donkey. Rachel watched and learned from Flash, “Henry” (the new kid), and their slow-growing friendship. Somehow, as she slowed down and gave her own heart some breathing space, these poky-but-gentle creatures helped her see her doubts and questions in a new light. Meanwhile, she discovered guidance in other unexpected places, until her bruised faith kindled again into a warm flame. This is one of the most encouraging books I’ve read in a long time. No doubt Rachel’s transparency and delightfully engaging voice get much of the credit. Although I’m flagging Walking With Henry as a Great Weekend Read, I actually recommend reading just a chapter or two at a time. Then let each “settle” a while. Tyndale, the publisher, sent me an Advance Reader Copy of this book in exchange for an honest review. Check out her website for this and more sugar-free goodness! I made a few practice batches, adjusting to taste (interpretation: used more cocoa and stevia, what else?) 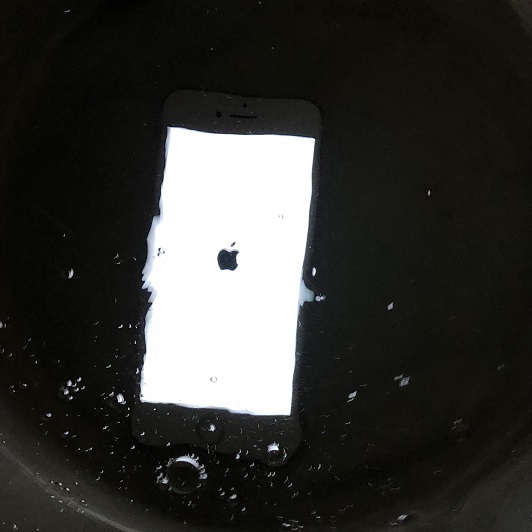 after each try. 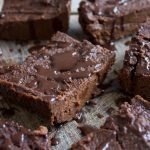 These are seriously good–moist and chocolaty, especially after my tweaks! Some of our church friends were to have a potluck at our house. Our group includes a grain-free couple, so I signed myself up for the Pumpkin Brownies along with the main dish. Since there’d be a dozen of us, I decided to increase the small-pan recipe by 50%. I’m quite confident in my ability to do this, as you’ll know if you read my Banana-Bread Math story. I rushed around the kitchen, adapting the amount of each ingredient in my head… on the fly… including some odd amounts, like 1/3 cup plus 3 tablespoons of cocoa powder. 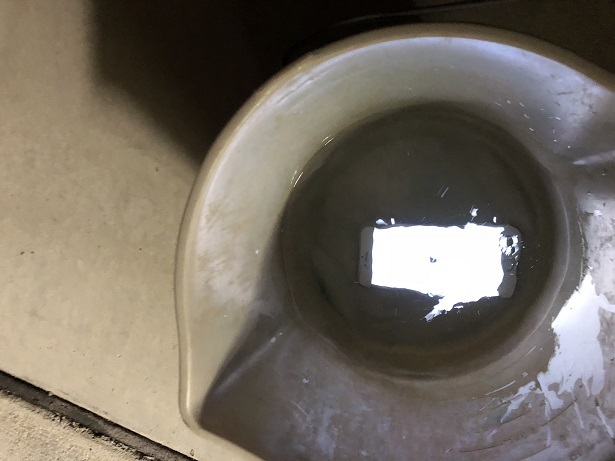 The only way to accurately increase 1/3 cup plus 3 tablespoons by half is to convert the measurement into teaspoons, add half the number of teaspoons, and convert the resulting (large) number back into cups or fractions thereof. I was on that math like burnt sugar on a pie pan. At long last, I popped the brownie pan into the oven and hustled the main dish together. The brownies looked slightly flat when I removed them from the oven, but I chalked it up to the different size pan. 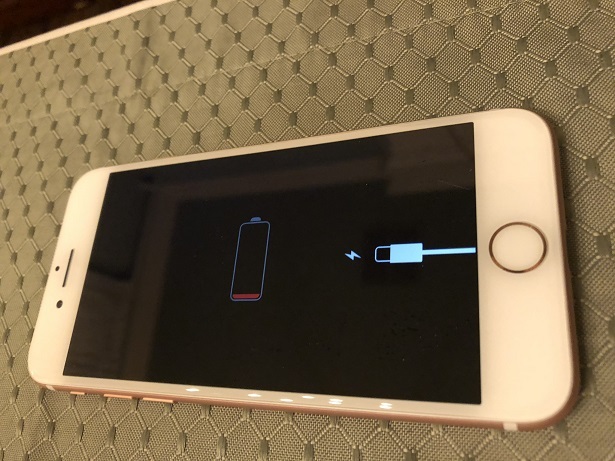 Maybe 50% was a little short. Whatever. Everyone arrived, we ate dinner, then it was time for dessert. I opened the fridge to grab the whipped topping and there, on the same shelf, was a partial can of pumpkin. The pumpkin I was going to finish off before I opened the new can. They weren’t terrible, but they lacked a certain something. Like the main ingredient. Later, I reminded Brent about the newlywed Tuna-Noodle Casserole (no tuna) that I’d been trying to live down since 1979. That reminded me of the Chicken Pot Pie with my freehand chicken cutout in the top crust instead of the usual three slits. You guessed it–I forgot the chicken. Ha, that was in 1999. I can hardly wait to see what I come up with for 2039. I’ve never read a book like this before. I don’t even know what to call it. Thriller? Mystery? Supernatural / Paranormal? Angel, spirit, or ghost–the Keeper doesn’t know exactly what he is. But he knows he needs to protect Michael Delacroix, a famous artist who is kidnapped and locked in a windowless room deep beneath a Napa Valley vineyard. This story is narrated in first-person, from The Keeper’s point of view. But since he can also enter people’s minds, we sometimes know what other characters are thinking. What makes this story a Great Weekend Read is the over-the-top creativity of the story line. I’ll even forgive Allen for my elevated pulse and blood pressure as the two women raced to rescue Michael. I mean, they had no idea what they were dealing with. 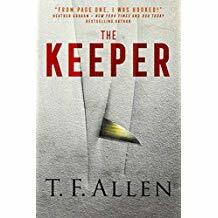 If you like thrills and shivers with a strangely satisfying ending, I highly recommend The Keeper. You can get the book for Kindle or in paperback by clicking here. Want to know more? Visit Allen’s website, https://toddallenauthor.com/. First, cookie jars don’t come with salt and pepper shakers. Plus, I found these particular salt and pepper shakers rather creepy. Second, I would not put my perfectly good chocolate-chip cookies inside a dead bird. So if you know the story behind these whimsical works of art, do tell! There’s room for you in the “Your Turn: Comments Welcome Here” box below the post, and I am truly curious. 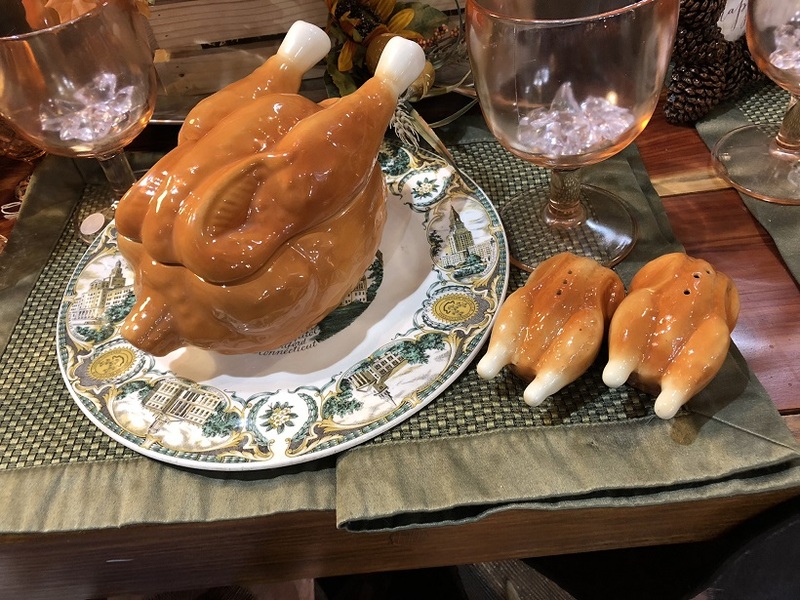 After all, everybody has a story… even fake dead birds.